It was the sixth-placed Brods’ heaviest defeat of the season and the Leeds side crashed through the 100 points barrier to reach 104, a tally which can only be matched by second-placed Heath with three rounds of fixtures left. Woodhead was quieter than usual, with 50-plus club members in Spain on the Beavers’ tour, and centre Matt Carbutt, who dislocated a finger at training on Tuesday, was added to the long list of absentees from the home playing ranks. When Moortown surged into a 14-0 lead down the slope with little more than a quarter of the game played, Brods were in danger of being sunk without trace. A plucky response got the deficit down to 12-17 early in the second half but Moortown upped their game and ran away with it late on as injured centre Michael Briggs, who was by far the home side’s best player on the day, and sin-binned flanker Ben Hoyle, looked on. 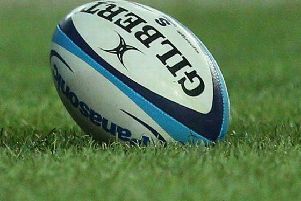 Excellent conditions were in contrast to the waterlogged pitches of seven days earlier and Moortown shrugged off early unforced errors to ensure total territorial dominance in the first half hour. Open side flanker Hoyle demonstrated his mobility with a superb cover tackle as Moortown broke down the right but it was only a question of time before the visitors broke through. Tom Moorby took a tricky pass well to score wide out on the right on 11 minutes and Sheridan Farley met minimal resistance as he ploughed over for the second on 23 minutes following a lineout drive. Eddie Crossley confidently stroked over both conversions. 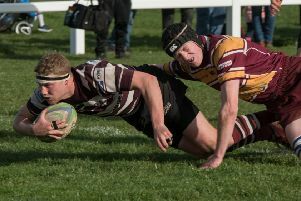 Joe Armitage made a great catch from a towering kick, the drafted in James Dodd made a decisive tackle to prevent another Moortown try and Alex Dawson won a turnover penalty as the Brods dug in. Their first excursion into the Moortown 22, via Joe Potter’s penalty to touch, yielded points on 33 minutes. Pocket Hercules Briggs typically broke through several tacklers to set up an advanced attacking position and young fullback Harris Morris comfortably touched down. Potter added an excellent conversion but Crossley made it 7-17 at the interval with a straight penalty after the referee had played a long, long advantage which had the home fans grumbling. Briggs got Brods on the front foot again in the second half and Dawson scored their second try on 46 minutes from a lineout catch and drive. Potter was unable to convert but the gap was down to five points and Moortown had a game on their hands. The visitors, who had ex-Brods backs coach Danny Monk on the sidelines, rose to the challenge against their tiring and further injury-hit hosts. Full back Mark Greenwood took advantage of a flat-footed home defence to score from a grubber kick and Crossley converted before adding a penalty to take the score to 12-27 on 62 minutes. The departures of Briggs and Hoyle left the home side further vulnerable. Centre Mark Shires cashed in on excellent work from Moorby to cross for the bonus point try with five minutes remaining and flanker Ross Muil rounded off some excellent support play on the left. Moortown also bombed a golden chance by knocking on with the line gaping. Brods’ backs coach Neil Sheard, in charge on the touchline with Ollie Akroyd required to play, said he was disappointed with the scale of the defeat after the players had worked hard to be in contention early in the second half.